"Some 7,000 armed police in heavy vehicles surrounded the Incirlik air base used by NATO forces in Adana in what a Turkish minister called a “security check.” With no official explanation, speculations have arisen about a new coup attempt or VIP visit. Some supporters of Turkish President Recep Tayyip Erdogan have reportedly flocked to the cordon surrounding the base. The scene, however, did not appear as massive and tense as the recent Adana protests demanding for the base to be shut down." Does anyone recall these things? So now what is the one thing "everyone" has been "so worried" about? ISIS getting their hands on nukes?? Incirlik holds at least 50 - FIFTY that is "Tactical" nukes? ? My my, isn't that really kind of convenient?? T that number must be at 1 or 0 by now! Turkey proposing that Russia, Turkey, Iran form a trio to stabilize the ME?? "WASHINGTON, Aug. 1, 2016 — Marine Corps Gen. Joe Dunford, the chairman of the Joint Chiefs of Staff, has arrived in Turkey to visit and speak to U.S. personnel stationed at Incirlik Air Base, Joint Staff spokesman Navy Capt. Greg Hicks said in a statement issued today. Additionally the chairman will meet with Turkey's Prime Minister Binali Yildirim and General Hulusi Akar, Chief of the Turkish General Staff, Hicks said. Hicks said Dunford will deliver messages condemning in the strongest terms the recent coup attempt and reaffirming the importance of the U.S.’s enduring partnership for regional security as symbolized by coalition operations out of Incirlik in the counter-ISIL fight, and the importance of Turkey's contributions to both the counter-ISIL coalition and NATO alliances." "Turkey’s defence minister said Monday that 311 soldiers including nine generals are still at large after this month’s failed coup. The decree, the third issued under a three-month state of emergency declared after the coup, gives the president and prime minister the authority to issue direct orders to the commanders of the army, air force and navy." 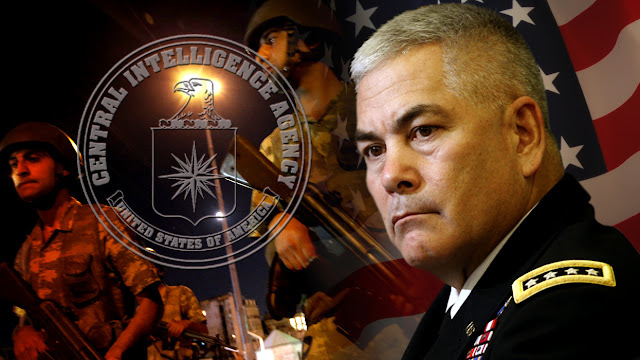 Former commander of the International security assistance force (ISAF), carrying out NATO-led operations in Afghanistan, General John F. Campbell is a key figure behind the coup attempt in Turkey, according to the authors of an independent investigation of Turkish newspaper "Yeni Şafak." According to their sources, he was responsible for the coordinating and directing the soldiers who participated in the events on July 15-16, that is actually for the organization of the coup. Campbell led the preparations in Turkey for eight and a half months. Under his direction originally was a group of about 80 CIA agents, who through a Terrorist organization of Fethullah Gulen (FETÖ) embedded subversive groups into the army and urged the military leadership of Turkey to support the coup. American General held regular secret meetings at Turkish military bases - Erzurum and Incirlik, military sources believe that he was solely in charge of promotion and discharge of officers on these bases. Followers of Gulen faster advanced in their career, received higher salaries and had other benefits. The archives of gulenists have been discovered during searches at Incirlik which contained extensive files on each member of agent network and members of their families. After the failed coup Cahit Bakır and Şener Topçu were arrested at Dubai airport by Turkish generals . Both met Campbell in Afghanistan, where they led a Turkish contingent of NATO forces. According to some Turkish military, in Afghanistan Americans actively worked with the military, converting them into gulenists. Dissenters and patriots were quickly physically eliminated, under convenient circumstances. Today the former associates of Campbell are testifying, one after the other exposing the chains of the network by which the CIA has literally entangled Turkey with their direct participation. U.S. has provided at least $2 billion for all the expenses. The funds coming via African banks were distributed by Campbell. In exchange for help the putschists promised to allow the United States to open a new military base on the Turkish-Syrian border, equipped with the latest technology. Also among the agreements was increasing the economic and military pressure on Russia, which would seriously change the balance of power in the region. However, Washington did not plan to endow the junta with full power. Campbell prepared a loyal and faithful regime on a short leash of U.S. intelligence. In case of excessive independence of the rebels there was a "Syrian plan", which included further spread of instability up to plunging Turkey into chaos on the model of Afghanistan, Libya, Iraq and Syria. "The United States Accused Of Creating Coup In Turkey"
"Angry military personnel, police officers and citizens of Turkey surrounded the NATO nuclear facility, Incirlik, last week. The facility is to be closed since this recent unrest has led to an extreme anti-American culture. Eminent danger is obviously a concern. The Incirlik military base may be closed in Turkey soon. Local residents and community organizations express this requirement in the form of protests against the US. According to them, the tanker aircrafts at the NATO air base helped to fuel aircrafts involved in the coup attempt. Political parties and public organizations in Adana (where Incirlik is located) demand to close the airbase. Local residents earn a living by working for military services from the US and other countries complain about the economic losses and tell Americans do not leave the territory of the base, as they have fear the reaction of local residents. Now the police is providing security at a high level after the attempt of a military coup, keeping all ins and outs of the air base under strict control. The police is vigilance in respect of anti-American actions. After the message that the coup was the control center of the Incirlik airbase, many non-governmental organizations, especially the Anatolian Youth Union (AGD) began to organize protests against the United States." "Aug 8 Turkish President Tayyip Erdogan said in an interview with Russia's TASS news agency published on Monday he wanted to reset relations with Russia from a clean slate and restart cooperation in a range of sectors. "This visit strikes me as a new milepost in our bilateral relations, starting again from a clean slate," Erdogan told TASS." "The US think tank Stimson Center is concerned about the risks posed by the storage of nuclear weapons in the Incirlik base in Turkey, a hundred kilometers from the Syrian border and a few months after a coup attempt. "It is impossible to know whether the United States could maintain control over weapons [of the Incirlik base] in case of prolonged civil war in Turkey," worries the US think tank Stimson Center, a report released Sunday, August 14. The situation is particularly worrying that the military infrastructure, located 110 kilometers from Syria, which are particularly present Daesh forces and Islamist groups, contains fifty US nuclear weapons . Overall, the think tank expressed concerns about storage by the United States of weapons of mass destruction outside its territory - and also stresses the high cost that this option represents. "The presence abroad [of nuclear weapons] induces the risk that they fall into the hands of hostile forces, or they become the target of terrorist attacks," explains the report. Because according to the Stimson Center, despite all precautions, the United States can not guarantee the inviolability of military bases of their allies in which they store their equipment. The co-author of the paper, Laicie Heeley and accurate to the agency AFP that "there are important safeguards (...) but these are only the protective devices, it does not eliminate the risk . In the case of a coup [in Turkey], we can not say with certainty that we would have been able to keep control [of nuclear weapons from the Incirlik base]. " time to get the F out , the world is waking up to this style of bully boy tactics ..
People they are telling us right to our faces their intent, but DO we see it?? The following is mind blowing imo, fwiw! "Joe Biden is Barack Obama’s mildly retarded uncle who lives in the basement. You bring him up for Thanksgiving and to go to the dentist, but the rest of the time, he’s a cellar dweller. Because you just don’t know what he’s going to do or say next. You know the incident/coup Turkey/Erdogan bothered me a bit.. Wasn't sitting true for me, then something about Hillary didn't feel kosher, the guy climbing Trump Tower, Kaine as VP pick. Just lots of small things. I watched a video I will post below, and lots of what he said was ringing my bells, as things I had been thinking about also, then when Biden did this today, well figured I'de just go ahead and put it out here for you to consider. So then, Erdogan has called himself the head of ISIS. 50 tactical nukes are at Incirlik, and that base is on lockdown since "the coup" attempt. Incirlik being a Turkish base, that Erdogan controls, NOT an American base, on foreign soil, that we control. I begin to seriously question all that bs about "the coup". Don't like what I'm thinking, as in no coup at all, but a sneaky way to put control of those nukes in Erdogan's hands, without anyone asking the right questions, while many false stories were floated, to confuse the issue. Erdogan also got to purge anyone not supporting him, (ie:ISIS? )so we are told. It has been said more than once that we must be "afraid" of ISIS getting their hands on nukes to attack us with. Meanwhile our borders are wide open with who knows who coming through, all with the blessings of Washington, it's recently been said that Hillary's emails divulged that she and Obama financed ISIS. Let's jump forward a tad, shall we? We all know that those in power have pulled out all the stops to stop Trump, including the replacement of Ailes at FOX News, and Dennis Michael Lynch, the top star at NewsMax, both of whom support Trump, while the owners of both of those corporations have donated millions to Hillary's campaign or the Clinton Foundation. We all surmise that the bigwigs are terrified of a Trump presidency, but but have we given any thought to exactly how much of a threat Hillary could actually be to those very same people? and how much of a threat this email problem just might really be? Some very bad things are being exposed. It's been said that she knows where all the bodies are buried, forgive the pun here, making a point. Hillary looks less and less capable of carrying on, and today Biden had to catch her as she slipped getting off the podium. Bill simply looks like death warmed over. I have actually wondered if someone was forcing her to continue for some unknown reason, because why wouldn't you just say I've had enough, I'm going to quit and get Bill and I the rest we need. They already have all the money, power and influence they need, and it will be left behind in the end. Sorry, not done. Now last week, iirc, some twenty year old was busy scaling what building in New York? Why Trump Tower, of course. Located where in NYC, Midtown Manhattan!! Who all was present? Well all sorts of Emer. personnel, police, vehicles, etc., plus thousands watching from the street, mesmerized, as in not paying attention to what anyone dressed in like manner was doing. I dare say, remotely controlled devices, homing devices, bombs, cameras, anything could have been taken into that building and not one person would have noticed a thing. Remember the Twin Towers? Let's not forget also, the very convenient timing of NYC's Police Chief, BIll Bratton's retirement from the police force, his last day will be Sept. 3rd, I believe. So then, where are the debates being held?? First debate at Hofstra University, Hempstead, NY. 19.36 miles from Trump Tower, and Midtown Manhattan. Where is the financial center in NYC, why also in Manhattan!! Times Square, Empire State Building, Statue of Liberty all well within a 25 mile proximity from Hofstra Univ. To have both presidential candidates in one place is very convenient, and no one would think anything of it. One candidate who has scared you and caused concern over serious breaches in security, and many things kept quiet are being exposed because of her carelessness, whose husband will also be present, and one candidate who has threatened to change everything you simply don't want changed. who might that king be? the Jesuit Pope or maybe George Soros, neither of whom want a Trump presidency and one who paid hundreds of people $15 an hour to protest Trump rallies? Got an error on the vid at the moment Breezy - and I actually had half and hour spare to watch it. Bugger. @ Breezy. OK just got to watch it and I am not convinced. It is very easy for a researcher to take numbers and situations and try to rationalise them into future dates or plans, but in order to manipulate results into a potential plan or event one just has to pick the stuff that matches and exclude the stuff that doesn't. I know that there are those saying that the event the remote viewers saw in August will be in a US city but I am not getting that at all this time around. I am not saying that another event will not happen in the US but I am not convinced an event that large will be in the next 90 days or so. Also the chess theory just didn't hit home with me. Yes, there may well be plans to disrupt the election so that Obama can call martial law and stop any election taking place but would that have to happen in the US or would a world war do the same trick for example. I still do not think we have hit the nail on the head so to speak with what's coming in the next 6-18 months. I cannot see nuclear war at this time so it may just be a 'natural' disaster that will do the same trick. There is no doubt that Hillary is a complete nutcase with medical issues that should prevent her from becoming President and it is unlikely they will allow Trump to get it either, but they are very smart and to second guess their plans or dates associated with them is questionable at best. I think that whatever happens (if it happens this year at all) will still surprise everyone. Thank you Jessica, for your thoughts. As I said, I really want to be wrong. My post was not made, based on the video, but more on things that have happened along with maybe scenarios. I just found it interesting, that he had some of the same thoughts, but took a different route to explain. I had totally spaced the remote viewers video when I posted, and recall that they said August, not September. I don't really believe in coincidences, and far too many things these days appear to be coincidental. In fact, here's another one. Before 9/11, the Pentagon announced it couldn't account for some $2.3 Trillion dollars. Now on August 8, 2016, the Pentagon is saying $6.5 Trillion is unaccounted for. Another coincidence? Those with the power and money get together, make their plans and then set about to make it happen, by manipulating media, people, governments, whomever and however they must. They plan a long time ahead, It is what they do, and generations fall in line, one after the other. I agree that they are smart, but there are always unknowns. Perhaps Hillary's seemingly bad health, has more to do with her finally realizing that her carelessness has made her just as vulnerable to those who work in the shadows as Trump is. Back when the Agency was investigating her, there were those who said the intel community was going to revolt, if she was not indicted. It sure seems it's possible this is what's happening, covertly. No one has any way to know what will happen, if anything, or when. I don't want to consider a nuclear attack, or even a devastating natural event, on anyone, anywhere, as a possibility, but I can't ignore those strange things that seem innocent (such as VP Biden pointing to the guy carrying the codes)yet really could be so important. "It seems that amerikanotourkiki friction, which came to the surface in the coup and remain Gulen in the US, but is rooted in the strategic plans of Washington in Mesopotamia and Syria, has many sequels. Defence and Foreign Relations Committees of the Russian Federation announced that Turkey may open its base Intzirlik the Russians and give permission to operate from there Russian planes in operations against terrorist groups in Syria. Igor Morozov, a member of the Committee of International Relations of the Russian Federation, in a statement made to the agency Ria Novosti news, said: "Turkey can give permission to the Russian Air Force to use the air base Intzirlik for operations against terrorist groups . This may be the sequel to the correct steps that will make the Turkish President to Russia. " For his part, Victor Ozerof, president of the Russian Federation Defence and Security Committee, said that such a decision may be taken in the light of the meeting had Putin and Erdogan in St. Petersburg. The Ozerof noted that Russia may not need the Intzirlik, but such a decision may have semantic meaning to the will of the two countries for cooperation in the fight against terrorism." "U.S. nuclear weapons are being moved out of Turkey as the country destabilises, and as relations between Ankara and Washington, D.C. deteriorate, according to sources speaking to the Euractiv website. Speaking on condition of anonymity, the sources decided to speak out after a Stimson Center report warned that American weapons stored at Turkey’s Incirlik Air Base could be captured by “terrorists or other hostile forces”. “It’s not easy to move 20+ nukes,” said one source, although the claims have not yet been independently verified. “Whether the US could have maintained control of the weapons in the event of a protracted civil conflict in Turkey is an unanswerable question,” said the Stimson Center report. “From a security point of view, it’s a roll of the dice to continue to have approximately 50 of America’s nuclear weapons stationed at Incirlik Air Base in Turkey,” co-author Laicie Heeley told AFP earlier this week. A second source told EurActiv that Washington-Ankara diplomatic relations had “deteriorated so much following the coup that Washington no longer trusted Ankara to host the weapons”. Instead, they claim, the United States are seeking to move the nukes to the Deveselu air base in Romania. The Deveselu Air Base, which is around 600 miles away from Incirlik, was picked in 2011 to host a U.S. Ballistic Missile Defense System which began operations earlier this year." "Damascus (AFP) - Syria condemned Wednesday's Turkish incursion into an Islamic State group-held border area as a "flagrant violation" of its sovereignty as Kurdish authorities said the action amounted to a "declaration of war". The operation -- named "Euphrates Shield" -- began around 4:00 am (0100 GMT) with Turkish artillery pounding dozens of targets of the Islamic State (IS) jihadist group around Jarabulus, the Turkish prime minister's office said. "Syria demands the end of this aggression," the foreign ministry said." From the minute he stepped off the plane on Wednesday, U.S. Vice President Joe Biden’s trip to Turkey seemed ill-fated. Intended to smooth relations frayed by last month’s botched coup, Biden’s visit instead showcased acrimony with Turkish President Recep Tayyip Erdogan. Turkey sent low-ranking officials -- including Ankara’s deputy mayor -- to greet Biden at the airport. And even before the vice president’s visit ended, the Daily Sabah, a pro-Erdogan newspaper, declared that "Biden wasted a trip, Turkey wasted time." Biden -- the highest-ranking U.S. official to visit Turkey since the coup -- was apologetic and conciliatory during his joint news conference with Erdogan. As the vice president spoke, the Turkish leader sat back in his chair, stone-faced. Turkish animosity toward the U.S. ratcheted up after the failed coup on July 15, followed by a purge of thousands of soldiers, government officials and even teachers by Erdogan’s government. The Turkish government blames a self-exiled cleric living in Pennsylvania, Fethullah Gulen, for inciting the coup and has demanded his extradition. Biden repeatedly offered condolences for the coup, sounding a different note than his boss, President Barack Obama, who chastised Turkish officials in July for spreading rumors that the U.S. was responsible. Biden called the coup’s perpetrators "terrorists," reflecting Erdogan’s language, and said, "I wish I could have been here earlier." So now Turkey has entered an IS controlled border area of Syria, bolstered by the US led coalition air cover, and Syria is mad, yet Biden gets the cold shoulder by Turkey. They all talk out both sides of their mouths. They all need to tend to their own business and stay in their own countries.